This statistic displays the seasonally-adjusted unemployment rate among persons between 16 and 24 years in the United States on a monthly basis. Seasonal adjustment is a statistical method for removing the seasonal component of a time series that is used when analyzing non-seasonal trends. Youth unemployment stood at 8.8 percent in March 2019. Unemployment rate by state can be found here, and the annual national unemployment rate can be found here. The United States Bureau of Labor Statistics track unemployment of persons between the ages of 16 and 24 years each month. In analyzing the data, the Bureau of Labor Statistics performed a seasonal adjustment—removing seasonal influences from the time series, such that one month’s rate of unemployment could be analyzed in comparison with another month’s rate of unemployment. During the period in question, youth unemployment ranged from a high of 9.1 percent in January 2019, to a low of 8.1 percent in November 2018. 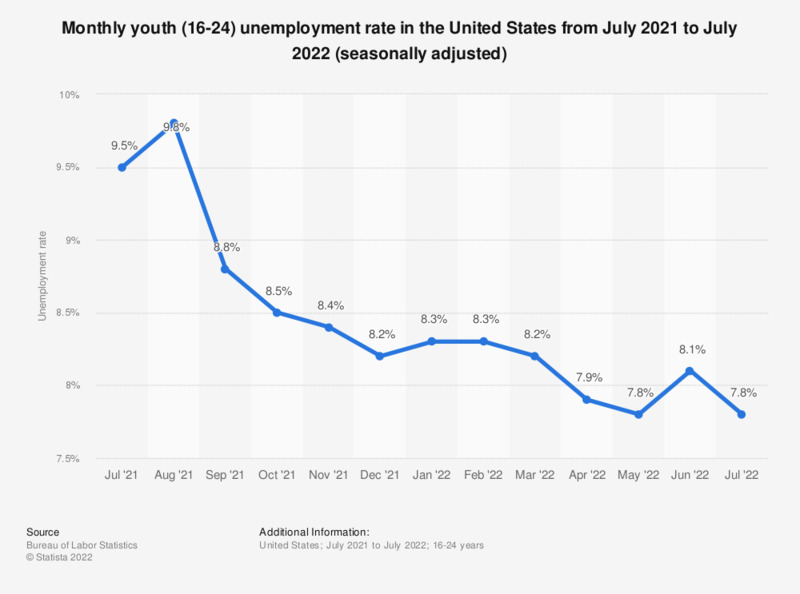 The national youth unemployment rate can be compared to the annual national unemployment rate in the United States. In 2018, annual US unemployment was at 3.9 percent, down from 9.6 percent unemployment in 2010. Additionally, as of February 2019, Alaska had the highest state unemployment rate of all U.S. states, at 6.5 percent unemployment.